Jimmy Carter said Friday he believes President Donald Trump would benefit from a few behind-the-scenes advisers who could help improve U.S. relations with China. 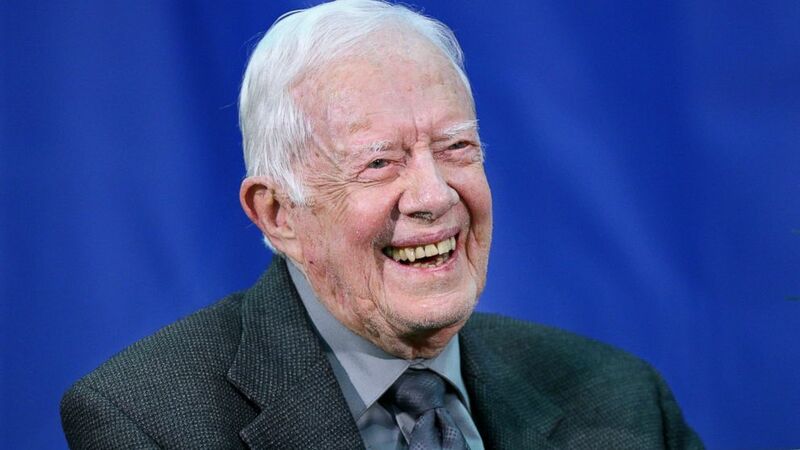 Speaking at the Carter Center in Atlanta, the former president said he relied during his presidency on an informal group of scholars, retired diplomats and other experts for advice on U.S. relations with Japan. "Just have a very small group — I'd say about six — of distinguished people who have faith and confidence," Carter said, given "the need for future understanding and the avoidance of conflict between our two countries." He added: "When I get home I'm going to draft a private letter to President Trump and put this in succinct language. Most presidents don't like to read multi-page letters." Carter's remarks came during a symposium marking 40 years since the U.S. and China struck an agreement to normalize diplomatic relations during Carter's presidency. Carter counts the breakthrough with China among the top accomplishments of his presidency. The two countries normalized diplomatic relations on Jan. 1, 1979, following an agreement that Carter and Chinese Vice Premier Deng Xiaoping announced on Dec. 15, 1978. Carter made no direct mention of the trade battle now being waged between the two countries. China's ambassador to the U.S., Cui Tiankai, joined Carter for the event and said "it has never been so important for China and the United States to work together." "The consequences of miscalculation resulting from misunderstanding and misinterpretation can be much more serious than ever before," the ambassador said.